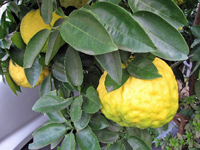 One thing that never fails to surprise foreigners who wander through Tsukuba`s traditional hamlets in December is the abundance and variety of CITRUS FRUITS which can be found weighing down the trees in the gardens of nearly every private home. Most people imagine these fruit to be the products only of of more southern climes, and in fact, Tsukuba ( Mt Tsukuba to be exact) IS the Northern limit for commercial citrus cultivation. Besides the usual tangerine-sized mikan are the miniscule FUKURE MIKAN, which besides being wonderful to look at glowing on their trees, are used as one of the components of SHICHIMI, Japan`s distinctive seven-spice seasoning. But there are still more citrus varieties growing in these gardens, most of them which I would not be able to identify without asking the locals. Among these is the YUZU (柚子), or citron, which seems to appear in disconcertingly many different sizes, shapes, skin textures and shades of color (which can sometimes make it hard to identify). These deliciously fragrant fruit ( more specifically, their rind) have long been an indispensible part of Japanese cuisine, especially as a flavoring in NABE, savory winter stews, and in one of my favorite dishes FUROFUKI DAIKON (風呂吹き大根). They are also used to make an assortment of traditional winter confections such as: yumochi (柚餅), yubeshi (柚餅子),and yuzu yo-kan (柚子羊羹)- DEELISH! But more importantly, since ancient times the yuzu has been used on the day of the WINTER SOLISTICE (to-ji, 冬至) as an addition to the evening bath. Not only do the yellow fruit make a beautiful sight floating in the water and provide a refreshing scent, but yuzu has been believed to possess certain qualities which invigorate the body and recharge it with LIFE FORCE. This is probably because yuzu is the fruit which remains ripe on the tree the latest ( or among the latest) in the year, staying firm and strong even when it grows harshly cold ( and maybe because they look like the sun, as well!). Today, I discovered another use for yuzu, one also takes advantage of its health-giving properties: making skin lotion! I learned of this traditional Japanese beauty-care product ( and how to make it) from Junko Takasaki,who in turn learned how to make it from her mother, who uses it everyday on her face and hands. I`ve never had the honor of meeting her mother, but one look at Junko-San`s fine complexion is recommondation enough for trying out this very easy ( and inexpensive) to make skin lotion. Remove the seeds from several yuzu. Place them in a jar. 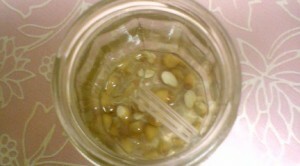 Add enough SAKE ( Japanese rice wine) or SHOCHU ( Japanese distilled liquor) to immerse the seeds. By the next morning, the oil from the seeds interacting with the alcohol will have made a lotion. You can keep it at room temperature. Use it everyday for the hands and face. I tried it myself this lotion this morning, rubbing the slippery liquid over my hands until it had evaporated- leaving a slight hint of the yuzu fragrance and my hands as smooth and soft as a baby`s bottom! 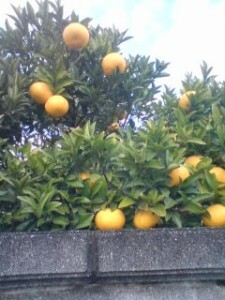 If you live in Tsukuba, you can just ask a local farmer for some yuzu. They will most probably be happy to provide you with a few! And just when I thought I had had my big scoop for the day, Harumi Takaya, who was also with us, told me about how she ( and many other women who grew up in Tsukuba`s traditional neighborhoods) do not use for or detergent for doing the dishes during the winter. Instead she uses citrus peels- especially those from mikan. Just you the inner part of the peel ( the white part) to scrub the pots, pans and dishes. Apparently this even cuts through heavy grease. Sounds like another all natural, cost-cutting idea ( with a long history of effetiveness) that you might want to try out.